He was her champion. She was his weakness. Together, they loved with wild abandon. Gustaf Ræliksen lives by the blade of his sword. After avenging his father’s murder and reuniting with his family, he wants nothing more than to settle down and have sons of his own. Only one woman will do—a fiery redhead he saved from the spoils of war. No longer forced to warm the beds of the men who've taken everything from her, Æsa has nothing to offer the noble warrior but her heart. When someone with a deep score to settle seeks revenge upon her, Gustaf's world is torn asunder. He has but one vow—saving the woman he loves from the ignorant fool who dared to best the temperate warrior. 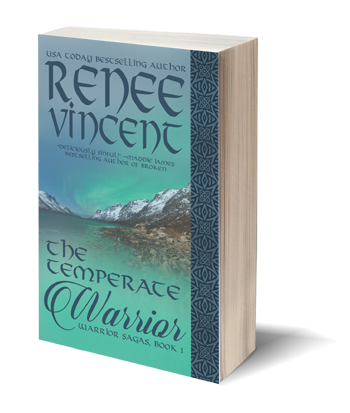 "An action-packed tale, THE TEMPERATE WARRIOR, the first book in gifted author Renee Vincent’s WARRIOR SAGAS, is a witty, sensual historical romance. I could not put it down, staying up late into the night to finish it. However, the lack of sleep was worth it. Although he is a strong warrior, Gustaf also has his tender side and helps Æsa understand her value as a woman, the one he loves. Brimming with humor, passion, complex and compelling characters, an intriguing plot, witty repartee, suspense, danger, tender romance and a one-of-a-kind love, this beautifully written story is delicious. A definite keeper! As readers of her previous books can attest, Ms. Vincent writes wonderful stories that stay in your memory long after the book is closed. I enjoyed THE TEMPERATE WARRIOR immensely and recommend it highly to anyone looking for a great story with plenty of heat, humor and heartfelt emotion. Do not miss it!" "Heartwarming, heart pounding, and spellbinding I can not find fault in this author’s work as she weaves each enchanting tale. The stories are beautiful and live in my mind long after having read them and they never fail to sadden me just a bit by their (albeit happy) end." "Vincent’s latest addition to her Emerald Isle Viking novels will satisfy those who have been waiting for Gustaf’s story. He’s the Viking warrior who is the older brother of Daegan, the hero in RAELIKSEN, book 1 in the Emerald Isle trilogy. Vincent writes well and has obviously done her research to accurately describe the culture of the Norsemen. You’ll enjoy this well written continuation of the story, though I do think you’ll find the second half more exciting than he first with some excellent fight scenes. (The first has quite a few steamy love scenes as Gustaf and Aesa reunite after a separation.) As always, there are side stories, and even a side romance for one of Gustaf’s warriors. **For the beginning of the romance between Gustaf and Aesa you’ll need to read MAC LIAM. And to understand that one, you’ll have to first read RAELIKSEN."